I am voting for potential blog name. On occasion as I am going through old business files I’ll see something I wrote and think “that was dumb” as I know more about the topic than I clearly did then. Nice that we accumulate more wisdom as we age rather than the other way around. Zen-Den, you may be right. Maybe I was thinking about starting a second blog, like I do from time-to-time. I agree about how, if you put your mind to it, it’s possible to accumulate wisdom along the way. Wouldn’t want to be one of those lost souls who never change, fearing growth. It sounds like the name for a best selling collection of short stories! You said it! That’s exactly what I need here. I can’t help thinking I must have had some *good* reason for writing these words on that page… ‘Ya know? I suspect it’s just a simple grocery list. Happens to me all the time, I get to the store and look at my list and ask myself, “Now why did I need flying pigs?” Or lemons, for that matter. Then since I can’t remember I don’t buy them and when I go to make whatever I had planned to make, I discover I needed the dang flying pigs. Or lemons. Conversely, I’d probably buy the swizzle sticks, certain I’d put them on my list for a good reason, and never, ever, use them. Zazzy, made me laugh out loud with that one. You may be onto the real reason I wrote this phrase. I like to try new recipes so who knows? A grocery list. Sure, that’s what it is. HOW ‘YA BEEN? Long time no see. I know. I’ve been lurking again. Consider me de-lurked. 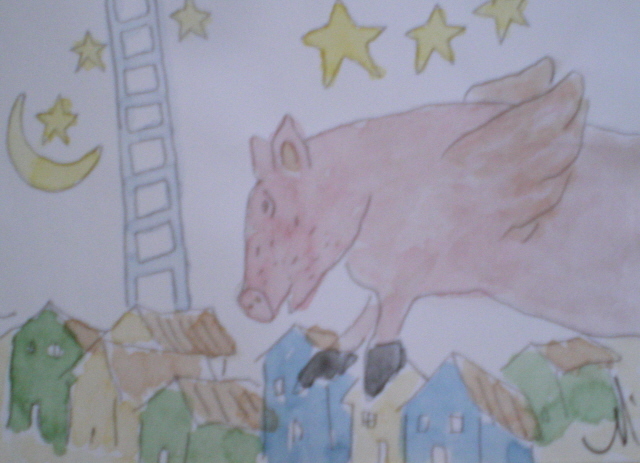 Who could resist flying pigs? Right? Who knows…maybe that’s supposed to be your sequel now that you’ve cleaned out the files…. LOL! Oh dear. I am so NOT a restauranteur, nor do I want to invest in one. But this would make for a unique name for a place. That I’ll admit. I was so curious because that sounds like something I’ve actually heard before, put together like that, not just random phrases…so of course I googled it! Didn’t help, but I did run into many ads for “flying pig swizzle sticks” that are readily available for purchase…? Perhaps you were contemplating a unique addition to your bar paraphernalia? YES! Some are rather cute actually…if you like flying pigs hovering over your cocktails! Perhaps you were attempting to cast a spell on someone! Lynn, I like that idea. I’m not entirely certain how spells come to be written, but there’s a certain *logic* to using this phrase while casting one. All. The. Time! Sticky notes on computer. Whoa, I bet that was a blog post but what was it about? Maybe a reminder to pay a bill (being whimsical of course). I never remember what my cryptic notes mean or why I wrote them and that’s just from yesterday, not 13 years ago! Was the puzzle one where you were to guess a themed answer? Could that be the reason for the note? In any case, I’d have rescued the crossword book, too. I need to get back to working those puzzles and shelve the knitting for a bit. My brain needs the workout more than my fingers. nance, I, too, wonder if I was thinking of using this as the title of a new blog, But what would the blog be about? The puzzle book was just puzzles, no guessing a themed answer– but good thought, my dear. When I found this puzzle book, destined to be destroyed, I remembered how much I loved doing crossword puzzles once upon a time. I’m glad I picked it up, it’s fun to do them again. Carrie, I might have been on the cusp of greatness back then, but now… not so much. Unless I remember what it was that I thought was so great about this phrase. Then I shall fly like a pig! Anne, sometimes you just have to laugh at yourself, don’t you? Absolutely! I laugh at myself all the time. I like to beat others to it. marian, I can see myself doing what you do. I’m forever jotting words or an idea on some piece of paper convinced that I’ll know what I meant when I read it later. But, of course, I forget whatever great idea I had– as evidenced by flying pigs & swizzle sticks. I’ve not been so colorful in my what-does-this-mean writings, but I have found scraps of paper and had no idea what I meant when I wrote it down, sure that I’d remember what it meant. Perhaps now that it’s in your conscious, your subconscious will do some work and alert you one day, quite unexpectedly, probably awakening you from a sound sleep in the middle of the night, to tell you what you meant. Tara, you’re probably right. I’ve told my subconscious in no uncertain terms to get with it, go through those mental back files, and figure out what I meant when I wrote this. I’m equally peeved and intrigued with myself right now. I see your artwork in my Dashboard Comment section, but it’s not showing up here on the blog. I don’t know why, but thank you for the link. Your artwork is spot on! Sounds like code for a Northern lady who settles down South. cupcakecache, I LOVE IT! You win the comment of the day. Should I ever move to the South, I’ve no doubt that someone would say: She’s just another flying pig and swizzle sticks trying to fit in down here with her Northern ways. Then they’d roll their eyes. Thank you! You have a way with words! Why, thank you very much Miss Cupcake. Oh my gosh, this made me laugh out loud! Too funny. Lacey, I laughed when I read what I wrote in that crossword puzzle book, too. I have no idea *ZILCH* what I meant by this, but it seems so clever. Yes! This happens to me and it drives me crazy. I feel like I should take better notes, TO MYSELF, so I don’t drive myself crazy in another decade when I come upon something….sigh…. Deb, I’m with you. I need to take better notes to myself. Clearly I’ve no idea what I’m talking about here, and I’m driving myself [sort of] crazy trying to figure it out. I’ve found phone numbers and song titles in my Sudoku puzzle book. How annoying! I remember almost writing a notation next to the phone number to alleviate my future self’s curiosity. Alas that I didn’t do it. And yet THAT I remember. When I (often) go back and read my past blog entries, and run across something I’ve mentioned that’s mysterious, I never remember what or whom I was writing about. That’s probably a good thing? Swizzlesticks for drinks at a party called Flying Pigs. Probably some kind of bacon liquor in the drink. 🙂 So strong they make you feel like you’re flying? What a fun turn of phrase and a real shame you don’t remember why you wrote it down! I was just clearing my office the other day when I found an old wall calendar of mine with all sorts of abbreviations and acronyms throughout that OBVIOUSLY meant something to me (and I kept the wall calendar for some reason too because I’m NOT a keeper of things) but I have ZERO idea and I made these notes for MONTHS!! How does that information get lost?!? I’m so confused as to what past me is trying to tell current me!! The first problem for me is trying to read that note. The I work on what I was thinking. Eilene, I understand. Another commenter mentioned that it’s possible that when I wrote these words I’d had a bit to drink. Not saying that I did or didn’t. But it’s a good explanation. Well now, I didn’t mean to suggest that YOU were drinking! No offense taken. In fact it’s almost 5 here, so an adult beverage could well be in my immediate future. L. Maire, I hadn’t thought of that, but you’re right it would make a good title for a memoir. Now what exactly is my memoir going to be about, she wonders? Oh I do love a good mystery, and I obligingly leave myself many of them with just such inscrutable messages. I totally delight in finding them and wondering whatever was I thinking. I love crossword puzzles as well, and they tend to get me thinking about how odd words are. Like swizzle sticks. There’s built in strangeness in that phrase. Likely invented by those very same flying pigs. And you, Ally, were the first to put it all together! Nice going. Deborah, you said it, this is a good mystery. I have no idea why I wrote these words years ago, but have had loads of fun talking about them here today. Maybe the whole point of flying pigs & swizzle sticks is merely to start conversations. I agree about crossword puzzles. Those clues, those squares– they appeal to my cerebral self, but at the same time nudge my spirit into putting together ideas in new ways. evilsquirrel13, I’d like to believe that my crossword puzzle book scribblings had great and profound import. HOWEVER, I have to concede that it’s possible that what I wrote means nothing. Just a mindless note in the margin while I contemplated a clue. I don’t attend to music like you do, so I forget almost everything that I hear and only remember a few songs at all. That being said, it’s hilarious how what seemed significant to you four years ago is now long forgotten. I often comment that my brain is a colander. Maybe yours is too! Obviously a hit tune being started….if you could only remember the rest of it, you’d probably sell it and buy that private tropical island you were dreaming about…. Susan, this messed with my brain, too. I was entertained/baffled when I stumbled upon this note in the margin of the crossword puzzle book. I wish I could recall why I wrote it, but at this point I’m beginning to think I wrote it so that I’d have a blog post to share over a decade later. That’s about as good of an explanation as any. Stay warm where you are and I promise to stay cool here. Thanks for stopping by to comment. Wonderful insight into the brains of Ally Bean. Drink tags? When pigs fly I will use swizzle sticks? Fascinating. joey, your mystery message is as baffling as mine. Whatever was I/ were you thinking? It’s funny to ponder, but also slightly disturbing to realize how much is lost inside my/your brain. Oh well, made for a good blog post. No need to fret. I often find random notes that I can’t figure out, especially with blog-related topics. Sadly they’re not from years ago, just weeks to months at most. Erika, I like the band name idea. Sure, that’s what I was thinking about… because I’m so musical… not.